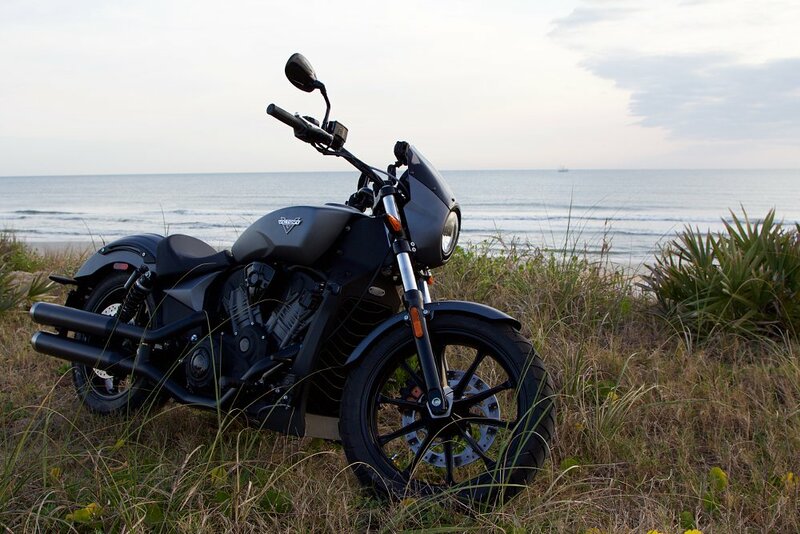 Upstart no more as it approaches its third decade, Victory Motorcycles has grown into a viable alternative to the American-made cruiser consumer by continuing to deliver well crafted, good-looking, and great-performing motorcycles to an audience hungry for choice. Case in point: the 2016 Magnum X-1 Stealth Edition. Launched a couple of years ago to feed the burgeoning big-wheel-bagger craze, the Magnum was never anything more than Victory’s successful Cross Country bagger stripped of its highway bars and augmented with a 21-inch front wheel, gaudy cosmetics, and a 100-watt stereo. With its scooped saddle, hawkish nose, and trendy accoutrements, the Magnum was, of course, a rousing success on both the boardwalk and the rally circuit. Last year, because Bagger Nation showed no signs of going gently (or quietly) into that soft goodnight of bike trends, Victory introduced the Magnum X-1, a slightly higher-priced edition outfitted with premium components, still gaudier paint, and an even louder stereo. Victory Magnum X-1 SE. Photo by Thomas Weiss. For 2016, the Magnum X-1 is called the Stealth Edition, and while it’s a bit ridiculous to bestow such a moniker on an almost 800-pound, nearly nine-foot-long bagger, the Stealth Edition does eschew last year’s trendy graphics and blinding chrome. (And despite selling out its initial production run, it also eschews last year’s MSRP, coming in at about $1,000 less.) Available in dealerships since March, the X-1 SE is mainly a cosmetic package, dressed in a suede-smooth monochrome grey with color-matched components and blacked-out engine, exhaust, and wheels, with raw chrome accents on its leading edges. Still, with its deep-throated rumble, booming 200-watt surround-sound stereo and searing LED headlamp, the X-1 Stealth Edition is about as stealthy as one of Daenerys Targaryen’s fire-breathing dragons. Entertainment options can be controlled through the dash display. Photo by Thomas Weiss. The stereo system connects to any Bluetooth-equipped device, such as an iPod or iPhone, or you can simply plug into the USB jack in the right saddlebag — particularly handy if you’ve ever drained your phone battery while riding and roaming. Using the informational LCD window on the dash, the rider can select sources from AM/FM/WX radio, USB, or Bluetooth. The volume is auto-synced, too, so it automatically lowers itself as speed decreases. For attention-seekers cruising the boardwalk, and especially those parked on Main Street, this is the ideal bagger for stylin’ and profilin’ — “stealth” be damned. The matte gray paint gives the motorcycle its "stealth" name, but with the stereo you can still hear it coming a mile away. Photo by Thomas Weiss. Further distinguishing the X-1 SE from the standard Magnum is its supple monochrome paint. It’s flat-out gorgeous, and the color is matched up and down the bike from the inner fairing to the lower chin shroud, including speaker grilles and lid hinges. Passers-by were hard-pressed to admire the SE without drawing a hand across its velvety finish. Things got a little heated when one Magnum owner swore I was lying when I told him my Magnum X-1 came as-is straight from the dealership. Accessory mini-apes put my wrists just below shoulder level, which felt fine and looked cool. Combined with that 21-inch front wheel, however, my X-1 SE was rather a pig to push around parking lots. Photo by Thomas Weiss. The 21-inch front wheel is the largest offered by an OEM, and billet means it’s carved from a single block of aluminum, providing strength and durability. In this case, unfortunately, the function doesn’t necessarily follow the form. The large wheel makes slow-speed maneuvers even more of a slog than on standard baggers, rendering useless the same, perfectly reasonable 29-degree rake found on the Cross Country. Even with both feet firmly on the ground, muscling the 787-pound (dry) X-1 SE around parking lots is a lesson in patience and power. And, occasionally, futility. 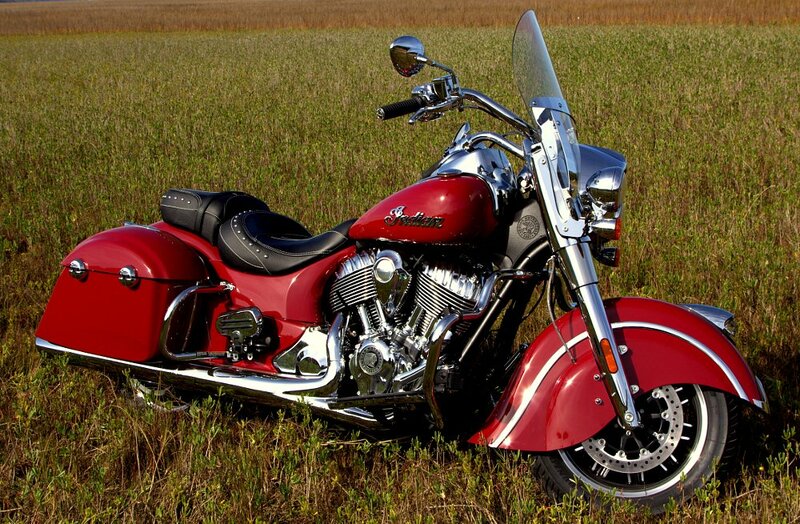 The 21-inch front wheel carved from aluminum is one of the defining characteristics of the Victory Magnum X-1 SE. Photo by Thomas Weiss. Once it gets going, though, the X-1 SE tracks beautifully on the street and handles as well on the twisties as it does the highway. Like the Cross Country’s, the Magnum X-1’s suspension — 5.1 inches of non-adjustable travel up front and a monoshock with 4.4 inches of air-adjustable play in the rear — and ABS-enabled braking — three 300 mm discs, two up front and one in rear — are both better than the Harley-Davidson Street Glide’s. And while Victory doesn’t provide power numbers and we couldn’t get our X-1 to a dyno before press time, it’s safe to say Victory’s Freedom 106 still eats Harley’s Twin Cam 103B for lunch — it always has. Look folks, this is a massive bagger, effectively a touring bike without the top case. Terms like flickable and agile sure as hell don’t apply here, but if you wanted to throw out adjectives like gutsy, surefooted, powerful, and relatively nimble, you’ll get no arguments from me. The Victory’s rear end resembles nothing so much as a bunch of grey bananas, flipped upside-down. Photo by Thomas Weiss. Victory knows how to make a long-distance machine; it’s no secret the Cross Country Tour stands with any BMW K 1600 GTL or Honda Gold Wing, let alone the Harley Ultra or Electra Glides, as one of the better long-haul motorcycles on the road. But despite sharing a few creature comforts with its sister model, the Magnum X-1 Stealth Edition is just not that kind of motorcycle. For most bagger fans, that’s okay. Now, a 5.8-gallon fuel tank is awesome. But, like most Big Twins, the Freedom 106 is a downright guzzler above 65 mph. I could literally see the needle on the fuel gauge falling from half to a quarter of a tank as I tried to make it to the hotel before dark. And as with a lot of bikes these days, that fuel gauge was annoying as all get-out. Even on the interstate it would read “F” for a solid hour after fill-ups, then drop to “E” within what seemed like minutes. Once that needle started to fall, man, it fell hard and fast. Since I’m nitpicking, a couple more points: The X-1 SE wisely makes use of several of the Cross Country’s finer long-haul amenities, such as the roomy, spring-mounted floorboards and capacious saddlebags. The fork-mounted fairing effectively brushes aside wind and debris from the upper body, although during one brief rain-soaked interstate blast I did daydream wistfully about fairing lowers. And the tinted clipped screen is, frankly, worthless beyond its appearance; prospective X-1 buyers hoping to do even light touring would be well advised to consider a larger shield. Finally, the low seat height paired with lip on the seat bucket forced me into a riding position that left my 33-inch inseam cramped after a few hours. If it weren’t for the floorboards, it would have been a very long weekend indeed, and I’m just five feet, 11 inches tall. Taller riders will definitely want to consult the accessory catalog for alternate saddles. The LED lights really work. Photo by Thomas Weiss. The X-1 SE features LED lighting front and rear, and it is a revelation. The headlight certainly illuminates the night road better than any halogen I’ve let guide my way. The high-beam setting spreads the beam wide rather than pointing it up high, so it's not aimed at the eyes of oncoming drivers. Caught in a blinding rainstorm one night in Laconia, I experimentally (read: desperately) flipped on the brights, and not once was I flashed by a driver. So while baggers may be the target du jour for purists, clearly there is an entire population of motorcyclists who are into this sort of thing. After all, Harley’s Street Glide is still the number-one-selling motorcycle in the United States, and it’s not real close. Now, at $23,499 the Magnum X-1 Stealth Edition is definitely not cheap (it is, in fact, a few hundred dollars more than the Street Glide Special). But for those who aren’t afraid to think outside the bagger, another quality alternative to the bar-and-shield has arrived. I can’t wait to see what Victory has in mind for its 20th anniversary.